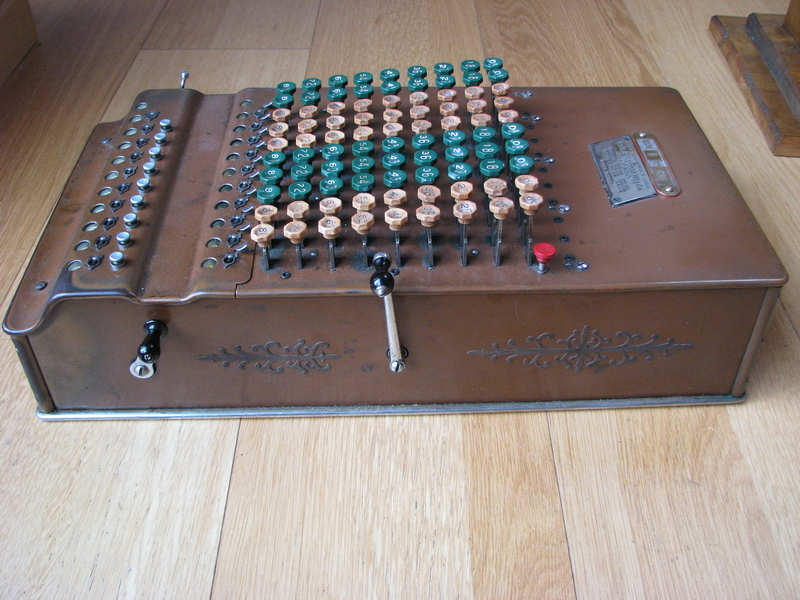 This machine falls somewhat outside the scope of the collection, as it is not a "real" four-function calculator. 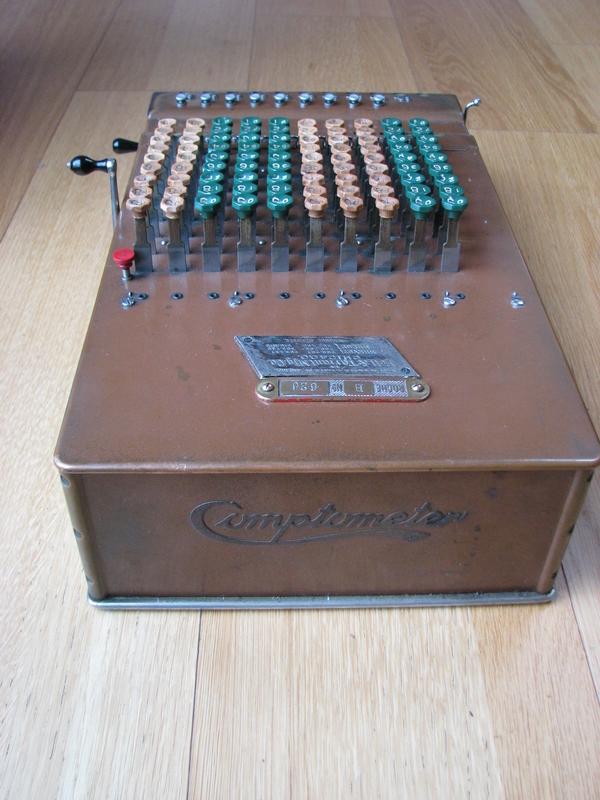 You will not hear me belittle the capabilities of the comptometer though, which has other advantages: being key-operated, it can save an enormous amount of time in the hands of a skilled operator, especially with long sums, where pinwheel or stepped drum machines are cumbersome at best, and the company was sheer genius in not only providing and developing the machines and making them completely fool-proof, but also in training the operators. Training for precision and speed offset for a large part the cumbersome performance of the comptometer in multiplication or division. 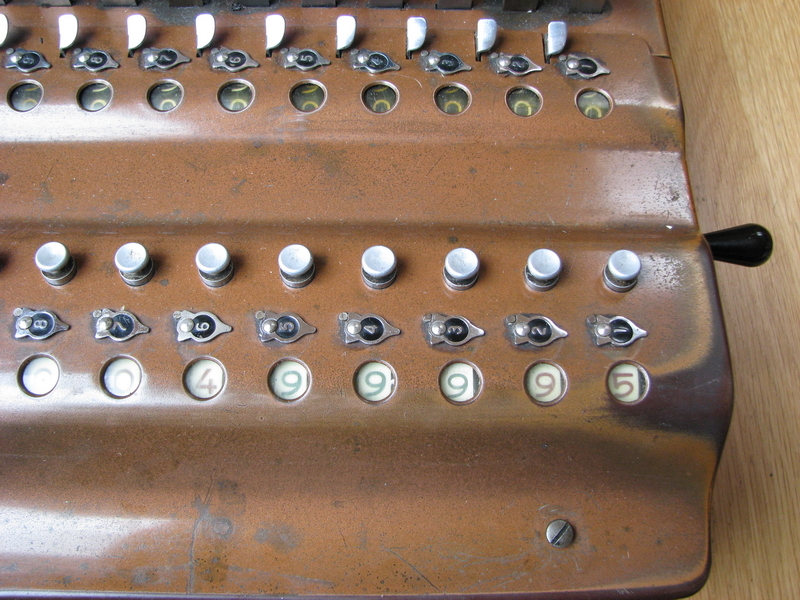 The Super Totalizer was a machine that catered for the happy few that had to be able to not only quickly tally large amounts of numbers, but also keep track of the subtotals without writing everything down and having to re-enter it into the machine later. 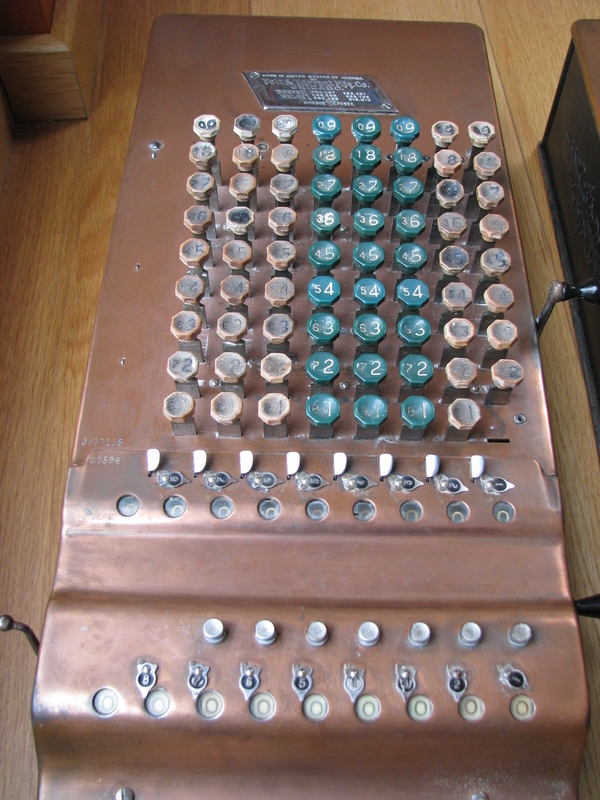 The machine was pioneered in the 1930s, and consists of an extra totalizer register in front of the normal totalizer. 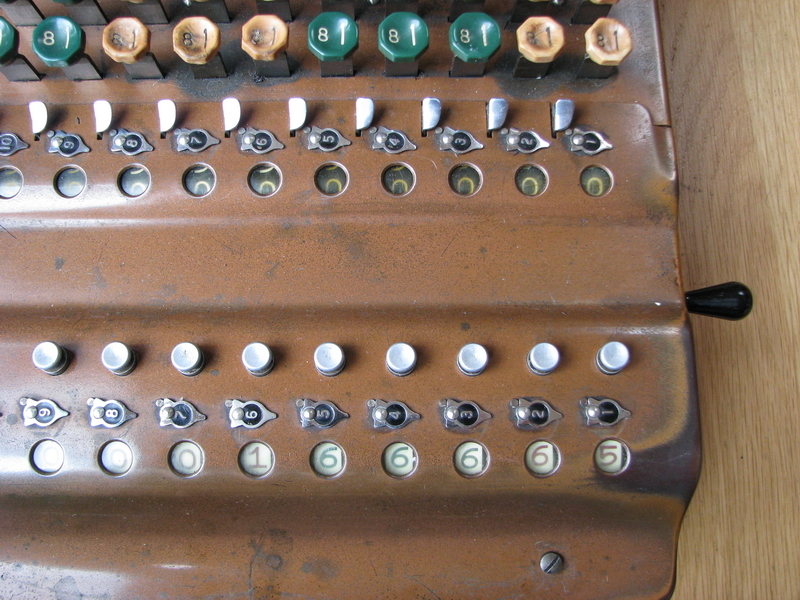 The J-type comptometer in the back functions just as normal, and only interacts with the front part through the transfer lever on the right of the machine, which will clear the regular totalizer, and transfer its contents to the front register, adding them to whatever number is already there. 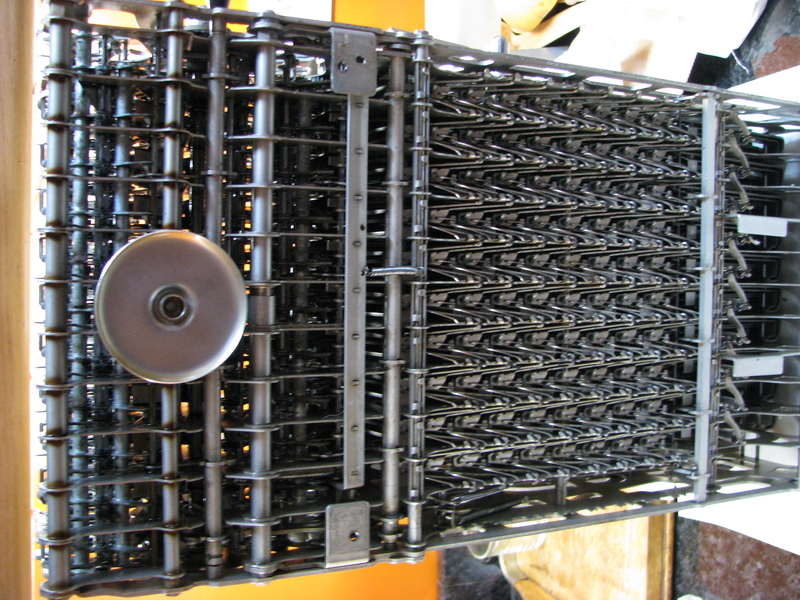 In addition, there are a few safeties, such as a lock on the transfer lever when no keys have been pressed in the machine and the result register is thus empty and cleared. 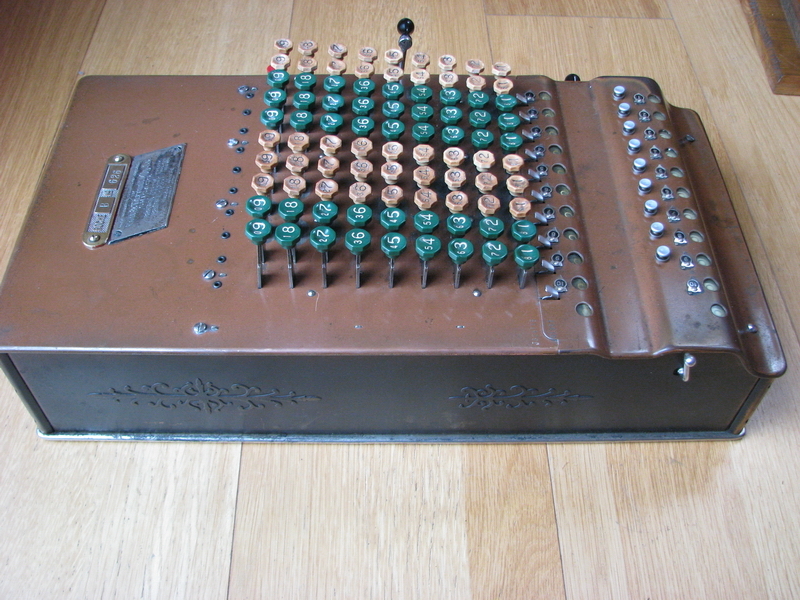 The machine I found and repaired is a ten-column machine and has the serial numbers J324725 for the comptometer itself, and S1957 for the totalizer. I also have another, 8 column example with numbers J339128 and S2594. 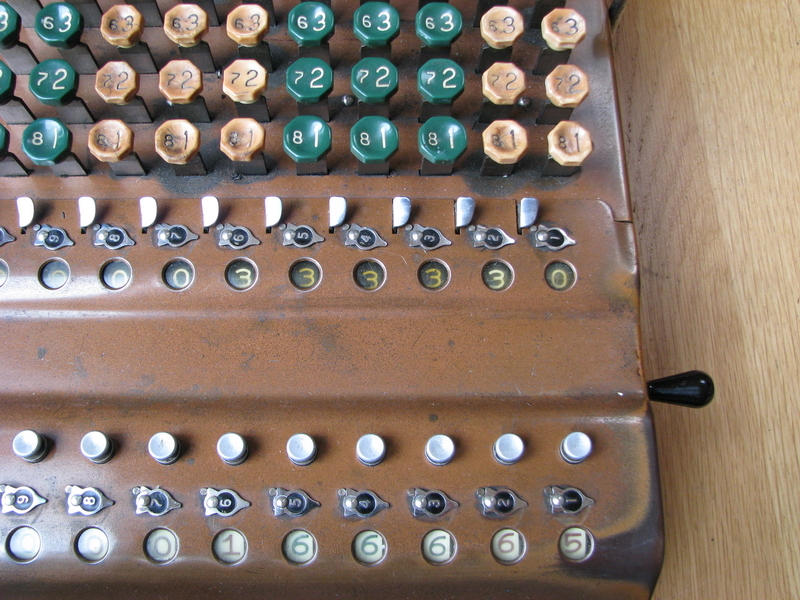 These 1930s comptometers often have a problem with the white keys, which appear as though the ink filling the impressions for the numbers has leaked out and blurred the entire key. 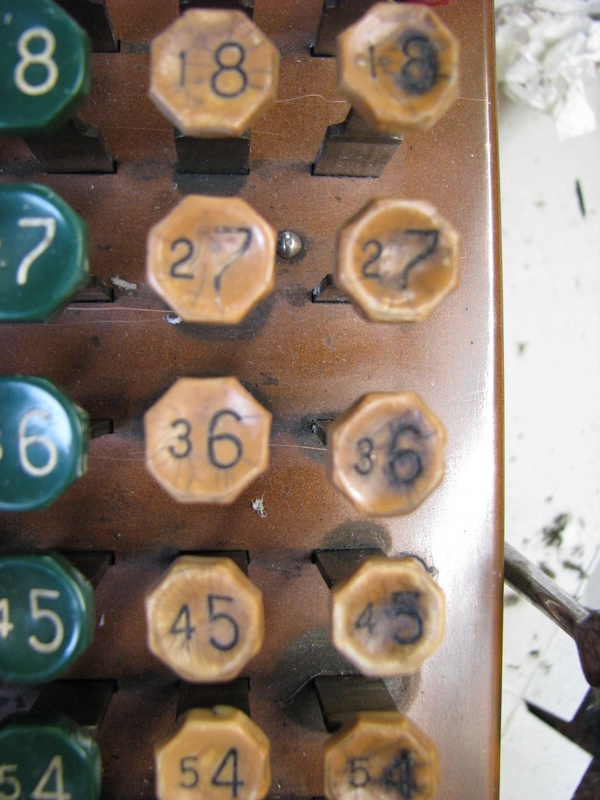 The 8 column example has this, on the 10 column one, it is far less obvious - the white keys have plenty of cracks, but seem serviceable nonetheless. 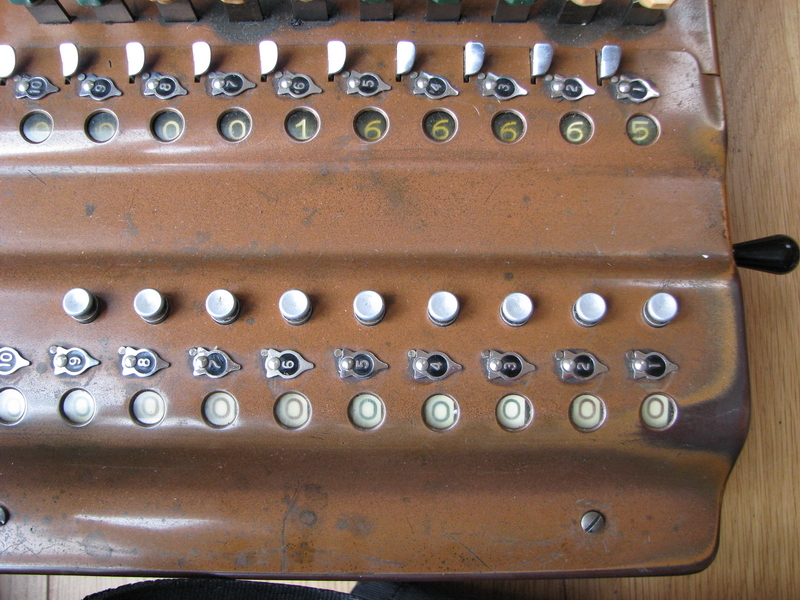 As far as restoration went, the small example works fine, but of course the keys need to be exchanged. 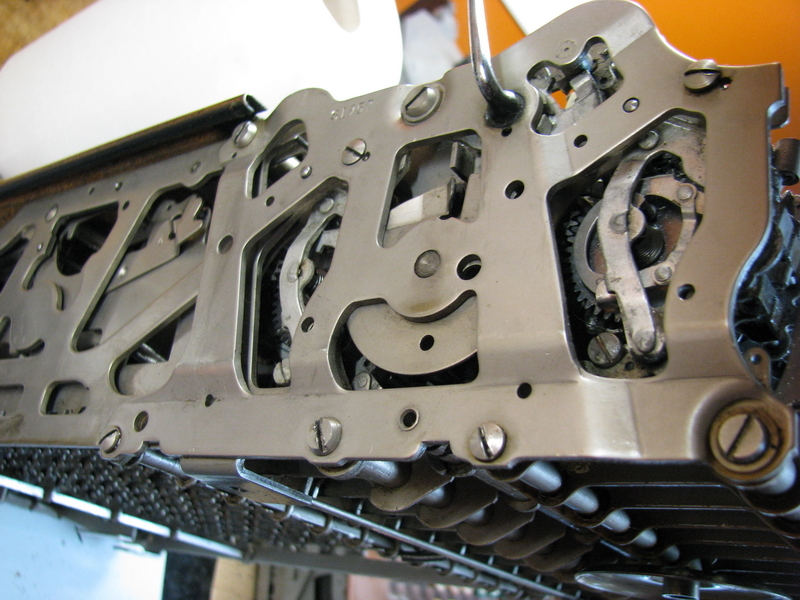 I have a parts machine, and the service manual can be found on the internet, so with reasonable mechanical aptitude, it is not an impossible task, but it is rather challenging nonetheless and will take you a few hours to complete at the very least. 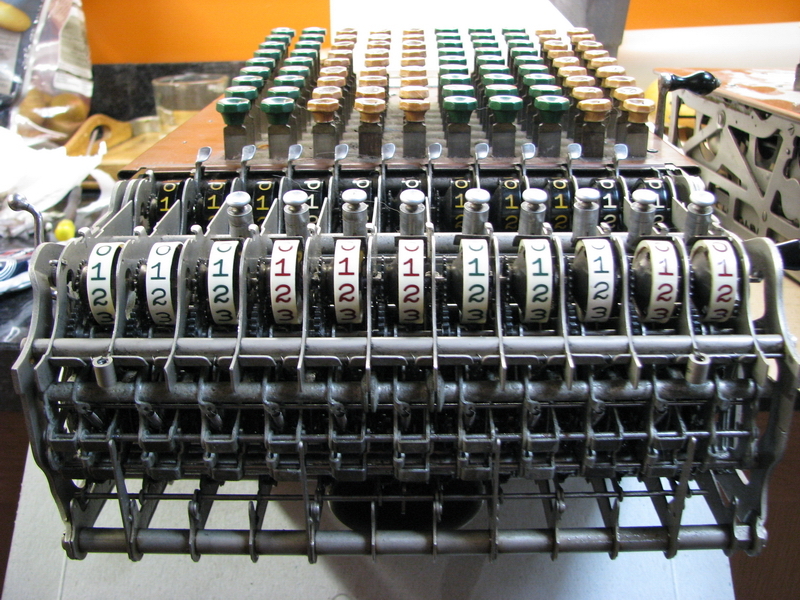 The ten column machine came to me in a state where the comptometer itself worked, the clearing for the super totalizer appeared to work as well, but the transfer lever was blocked. I opened the machine (four screws on the bottom, and the entire machine lifts out of the housing, don't touch the corner screws, they only hold the housing together) to have a look and was immediately reminded why I prefer pinwheel machines - the interior is just so full - you cannot see anything, let alone reach anything. One has to admire the design that went into this though. 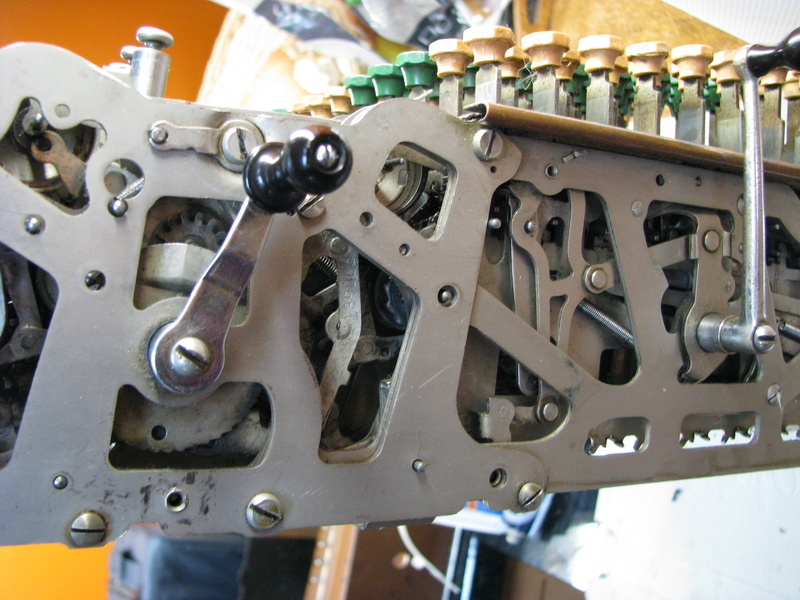 The problem with the front register turned out to be that it would not tilt back into engagement with the driving gears - clearing in a comptometer register is simply a question of tilting it slightly forward, so the numeral wheels disengage from the driving gears. Since the numeral wheels are spring loaded, they then all jump to zero. Of course, the super totalizer has a safety (the rectangular pin sliding down into the slot in the large circular part in the middle of the last picture above) which prevents the transfer lever from turning when the clearing has not been completed - and it hadn't because the register was stuck. Once the problem had been established, judicious wiggling of the driving gears with a very long thin screwdriver found the culprit, and suddenly everything clicked back into place and the machine now works just fine. Some cleaning of the keys was undertaken as well - the row on the right is still as found, the one next to it has been cleaned up with metal polish (which works just fine on plastics too - it is simply a fine polishing compound). 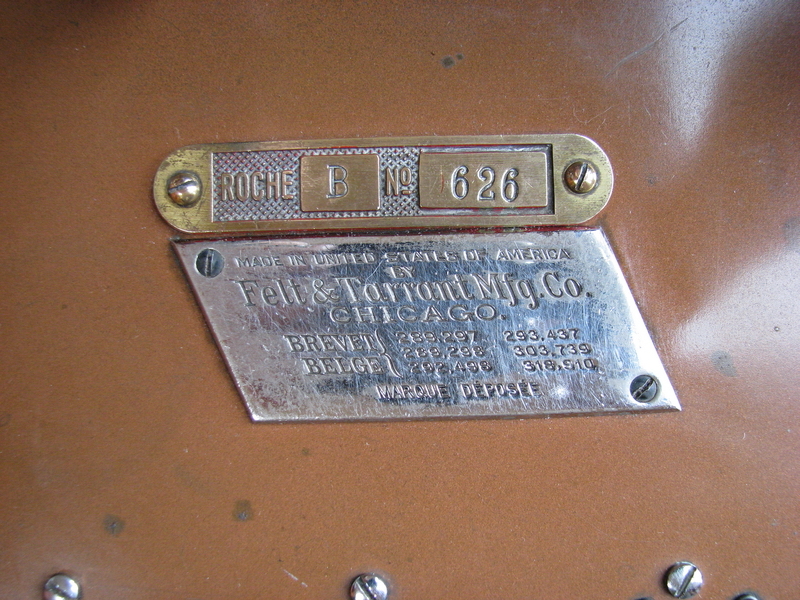 The machine was bought from a doctor, who probably got it from the Roche pharmaceutical company in Vilvoorde - as the brass inventory plate testifies. It has been used there for a long time, because the maintenance sticker in the front probably dates from the early 1960s. 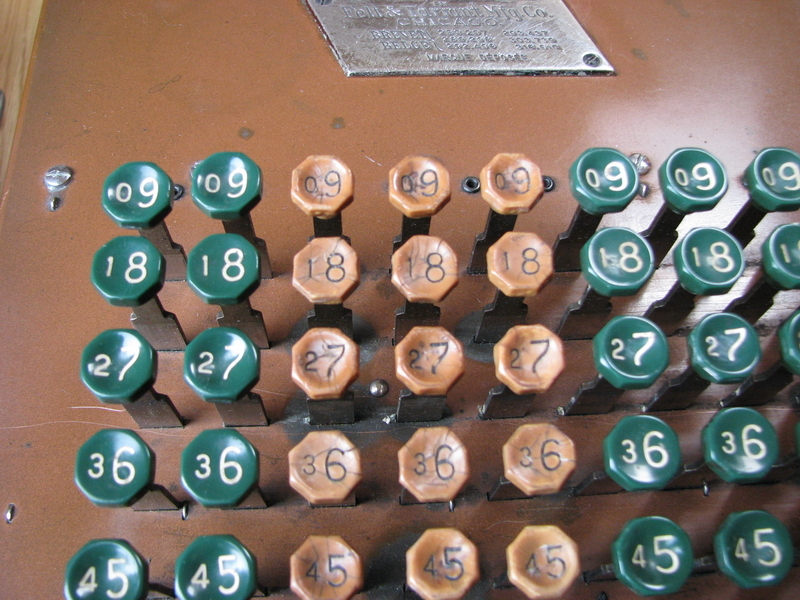 Most other safeties are identical to those in a regular comptometer - you hear a bell when entering the first number after clearing to assure you that the register was clear, and not pressing a key completely will block the affected row, so a correction can be made with the help of the red button on the top right. Pressing two keys at once in a single row is impossible too. Clearing the register works as normal - twist the clearing lever to the front over a 30° angle and release. For the transfer, a little more effort is needed - the transfer lever has to be rotated clockwise over 360° to effect the transfer (and, unless you are aware of this issue, will probably catch your fingers between the lever and the table top - this is why the knob rotates, you hold it with two fingers at the sides instead of gripping it all around ...). 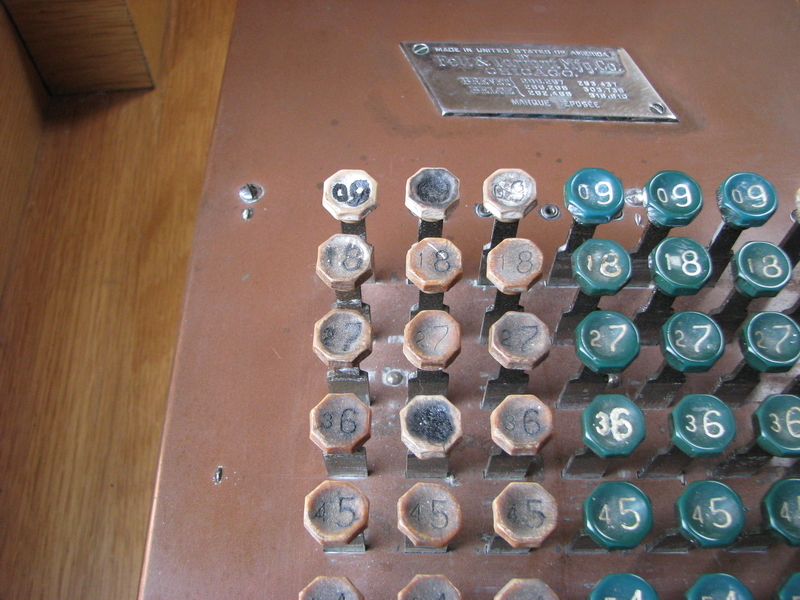 Also here, a bell will ring (at a lower pitch) when the register was clear. Clearing the super totalizer is done by pulling the small metal lever on the left to the front. To show you the entire process, here is an example: we sum 11111 (ding! ), 22222, 33333, 44444, 55555 and arrive at 166665 in the result register. We then rotate the transfer lever (dong!) 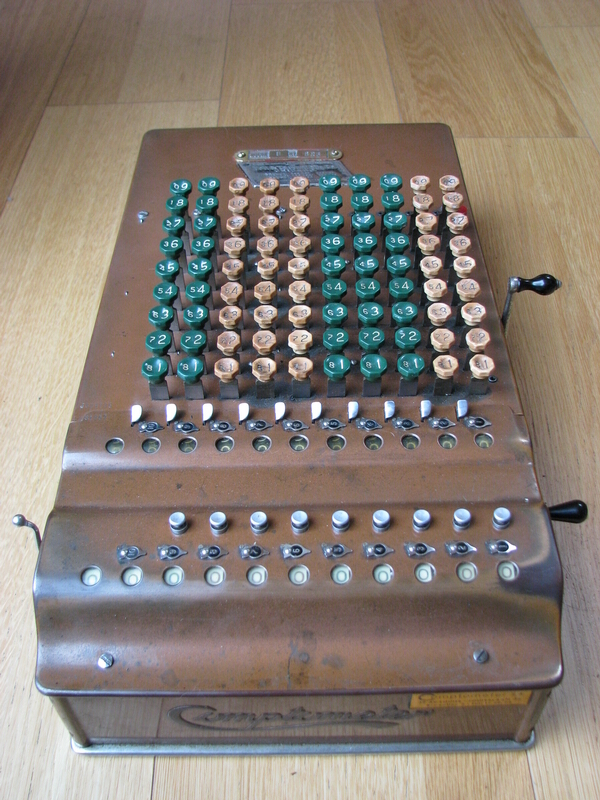 which clears the result register while simultaneously transfering the numbers to the totalizer. Now wo do the same thing with 66666 (ding! ), 77777, 88888, 99999, and arrive at 333330 in the result. Rotating the transfer lever (no dong this time) adds this number to what was already in the super totalizer register to give 499995 and clears the result register.